This post will introduce John Ehlers’s Autocorrelation Periodogram mechanism–a mechanism designed to dynamically find a lookback period. That is, the most common parameter optimized in backtests is the lookback period. Before beginning this post, I must give credit where it’s due, to one Mr. Fabrizio Maccallini, the head of structured derivatives at Nordea Markets in London. You can find the rest of the repository he did for Dr. John Ehlers’s Cycle Analytics for Traders on his github. I am grateful and honored that such intelligent and experienced individuals are helping to bring some of Dr. Ehlers’s methods into R.
The point of the Ehlers Autocorrelation Periodogram is to dynamically set a period between a minimum and a maximum period length. While I leave the exact explanation of the mechanic to Dr. Ehlers’s book, for all practical intents and purposes, in my opinion, the punchline of this method is to attempt to remove a massive source of overfitting from trading system creation–namely specifying a lookback period. SMA of 50 days? 100 days? 200 days? Well, this algorithm takes that possibility of overfitting out of your hands. Simply, specify an upper and lower bound for your lookback, and it does the rest. How well it does it is a topic of discussion for those well-versed in the methodologies of electrical engineering (I’m not), so feel free to leave comments that discuss how well the algorithm does its job, and feel free to blog about it as well. One thing I do notice is that this code uses a loop that says for(i in 1:length(filt)), which is an O(data points) loop, which I view as the plague in R. While I’ve used Rcpp before, it’s been for only the most basic of loops, so this is definitely a place where the algorithm can stand to be improved with Rcpp due to R’s inherent poor looping. Those interested in the exact logic of the algorithm will, once again, find it in John Ehlers’s Cycle Analytics For Traders book (see link earlier in the post). Of course, the first thing to do is to test how well the algorithm does what it purports to do, which is to dictate the lookback period of an algorithm. Let’s run it on some data. Now, what does the algorithm-set lookback period look like? Let’s zoom in on 2001 through 2003, when the markets went through some upheaval. In this zoomed-in image, we can see that the algorithm’s estimates seem fairly jumpy. Here’s some code to feed the algorithm’s estimates of n into an indicator to compute an indicator with a dynamic lookback period as set by Ehlers’s autocorrelation periodogram. And here is the function applied with an SMA, to tune between 120 and 252 days. As seen, this algorithm is less consistent than I would like, at least when it comes to using a simple moving average. For now, I’m going to leave this code here, and let people experiment with it. I hope that someone will find that this indicator is helpful to them. NOTES: I am always interested in networking/meet-ups in the northeast (Philadelphia/NYC). Furthermore, if you believe your firm will benefit from my skills, please do not hesitate to reach out to me. My linkedin profile can be found here. Lastly, I am volunteering to curate the R section for books on quantocracy. If you have a book about R that can apply to finance, be sure to let me know about it, so that I can review it and possibly recommend it. Thakn you. Since I’ve hit a rut in trend following (how do you quantify rising/falling/flat? What even defines those three terms in precise, machine definition? How do you avoid buying tops while not getting chopped by whipsaws? ), I decided to look the other way, with oscillators. Certainly, I’m not ready to give up on Dr. Ehlers just yet. So, in this post, I’ll introduce a recent innovation of the RSI by Dr. John Ehlers. The indicator is Dr. Ehlers’s modified RSI from Chapter 7 of Cycle Analytics for Traders. For starters, here’s how the Ehlers RSI is different than the usual ones: it gets filtered with a high-pass filter and then smoothed with a supersmoother filter. While Michael Kapler also touched on this topic a while back, I suppose it can’t hurt if I attempted to touch on it myself. Here is the high pass filter and the super smoother, from the utility.R file in DSTrading. They’re not exported since as of the moment, they’re simply components of other indicators. In a nutshell, both of these functions serve to do an exponential smoothing on the data using some statically computed trigonometric quantities, the rationale of which I will simply defer to Dr. Ehlers’s book (link here). Here’s a picture comparing four separate RSIs. The first is the RSI featured in this post (cycle RSI) in blue. The next is the basic RSI(2) in red. The one after that is Larry Connors’s Connors RSI , which may be touched on in the future, and the last one, in purple, is the generalized Laguerre RSI, which is yet another Dr. Ehlers creation (which I’ll have to test sometime in the future). Buy when the CycleRSI(2) crosses under 10 when the close is above the SMA200, which is in the vein of a Larry Connors trading strategy from “Short Term ETF Trading Strategies That Work” (whether they work or not remains debatable), and sell when the CycleRSI(2) crosses above 70, or when the close falls below the SMA200 so that the strategy doesn’t get caught in a runaway downtrend. Since the strategy comes from an ETF Trading book, I decided to use my old ETF data set, from 2003 through 2010.
strategy.st <- portfolio.st <- account.st <- "Cycle_RSI_I"
Overall, the statistics don’t look bad. However, the 1:1 annualized returns to max drawdown isn’t particularly pleasing, as it means that this strategy can’t be leveraged effectively to continue getting outsized returns in this state. Quite irritating. Here’s the equity curve. In short, as with other mean reverters, when drawdowns happen, they happen relatively quickly and brutally. Here’s an individual instrument position chart. By the looks of things, the strategy does best in a market that grinds upwards, rather than a completely choppy sideways market. Finally, here’s some code for charting all of the different trades. .main <- "Maximum Adverse Excursion (MAE)"
.xlab <- "Run Up (cash)"
.main <- "Maximum Favourable Excursion (MFE)"
.xlab <- "Run Up (%)"
.xlab <- "Run Up (ticks)"
One last thing to note…that $50,000 trade in the upper left hand corner? That was a yahoo data issue and is a false print. Beyond that, once again, this seems like standard fare for a mean reverter–when trades go bad, they’re *really* bad, but the puzzle of where to put a stop is a completely separate issue, as it usually means locking in plenty of losses that decrease in magnitude, along with possibly turning winners into losers. On the flip side, here’s the maximum favorable excursion plot. In short, there are definitely trades that could have been stopped for a profit that turned into losers. In conclusion, while the initial trading system seems to be a good start, it’s far from complete. This week, I attempted to use Ehlers’s own idea from this presentation. The settings I used were John Ehlers’s original settings — that is, a 20 day analysis period, a 10 day exponential band smoothing (that is, the band is computed as .1*(high-low)+.9*band), entered upon the percent B (that is, the current FRAMA minus the low band over the difference of the bands), and the fraction is 1/10th of the daily range. strategy.st <- portfolio.st <- account.st <- "FRAMA_BANDS_I"
Now while it may have worked in the past (or something similar to it, using Ehlers’s filter indicator), it doesn’t seem to do so going forward. I’ll leave this here for now as a demonstration of how to do Ehlers bands. So the last time that a FRAMA strategy was tried with price crossovers, the problem was that due to counter-trending failures, the filter that was added missed a lot of good trades, and wound up losing a lot of money during flat markets that passed the arbitrary filter. This trading system tries to rectify those issues by trading a rising FRAMA filtered on a 5-day standard deviation ratio. The hypothesis is this: the FRAMA rises in legitimately trending markets, and stays flat in choppy markets. Therefore, the ratio of standard deviations (that is, a running standard deviation of the FRAMA over the standard deviation of the market close) should be higher during trending markets, and lower during choppy markets. Additionally, as this ratio bottoms out at zero and usually tops out at 1 (rarely gets higher), it can be used as an indicator across instruments of vastly different properties. The data that will be used will be the quandl futures data file (without federal funds, coffee, or sugar, because of data issues). strategy.st <- portfolio.st <- account.st <- "FRAMA_SDR_I"
In other words, typical trend follower results. 40/60 wrong to right, with a 2:1 win to loss ratio. Far from spectacular. In short, winners last longer than losers, which makes sense given that there are a lot of whipsaws, and that this is a trend-following strategy. 38%. So how did it perform? In other words, about 10 basis points of returns per percent of market exposure, or a 10% annualized return. The problem being? The drawdown is much higher than the annualized return, meaning that leverage will only make things worse. Basically, for the low return on exposure and high drawdown to annualized return, this strategy is a failure. While the steadily ascending equity curve is good, it is meaningless when the worst losses take more than a year to recover from. In any case, here’s a look at some individual instruments. Here’s the equity curve for the E-minis. So first off, we can see one little feature of this strategy–due to the entry and exit not being symmetric (that is, it takes two conditions to enter–a rising FRAMA and a standard deviation ratio above .2–and only exits on one of them (falling FRAMA), price action that exhibits a steady grind upwards, due to the rapid change in ATR (it’s a 10-day figure) can actually slightly pyramid from time to time. This is a good feature in my opinion, since it can add onto a winning position. However, in times of extreme volatility, when even an adaptive indicator can get bounced around chasing “mini-trends”, we can see losses pile on. Next, let’s look at a much worse situation. Here’s the equity curve for the Eurodollar/TED spread. In this case, it’s clearly visible that the strategy has countertrend issues, as well as the fact that the 5-day standard deviation ratio can be relatively myopic when it comes to instruments that have protracted periods of complete inactivity–that is, the market is not even choppy so much as just still. I’ll leave this here, and move onto other attempts at getting around this sort of roadblock next. So, it is possible to create a trading system that can correctly isolate severe and protracted downturns, without taking (too many) false signals. 126 day FRAMA, FC=4, SC=300 (we’re still modifying the original ETFHQ strategy). A running median (somewhere between 150 days and 252 days–seemingly, all these configurations work). Both the FRAMA and the confirmatory median must be moving in the same direction (up for a long trade, down for a short trade–the median rising is the new rule here), and the price must cross the FRAMA in that direction to enter into a trade, while exiting when the price crosses below the FRAMA. Presented as a set of quantstrat rules, it gets rather lengthy, since a rule needs to specify the three setup conditions, a rule to bind them together, and an exit rule (5 rules each side). Basically, it makes money in terrible periods, but gives some of it back during just about any other time. It’s there just to put it out there as something that can finally try and isolate the truly despicable conditions and give you a pop in those times. Other than that? Using it would depend on how often someone believes those sorts of drawdown conditions would occur–that is, a descending adaptive indicator, a descending 7-12 month median. In other words, it’s absolutely not a standalone strategy, but more of a little something to give a long-only strategy a boost during bad times. It’s certainly not as spectacular as it gets. For instance, here’s the equity curve for XLK in late 2008-2009. Mainly, the problem with the ETFHQ strategy (I’m still on that, yes) is that it does not at all take into account the magnitude of the direction of the indicator. This means that in a reverting market, this strategy has a potential to lose a great deal of money unnecessarily. Basically, this strategy is highly conservative, meaning that it has a tendency to miss good trades, take unnecessary ones, and is generally flawed because it has no way of really estimating the slope of the FRAMA. As the possible solution to this involves a strategy by John Ehlers, I think I’ll leave this strategy here for now. So, to send off this original ETFHQ price cross strategy off, I’ll test it out of sample using a 200-day median, using both long and short sides (from 2010-03-01 to get the 200 day median burned in, to the current date as of the time of this writing, 2014-06-20). In short, definitely not good. Why? This is the out-of-sample equity curve of SHY–that is, the ETF of short term bonds. The trend had ended, but the trading system didn’t pick up on that. In this instance, using such a conservative confirmatory indicator for the short trade and simply using that same indicator for the long side indicates that there may very well have been overfitting on the system. On a more general note, however, this picture makes one wonder whether a confirmatory indicator was even necessary. For instance, there were certainly protracted periods during which there was a long trend that were cut off due to the running median being slightly negative. There were both long and short opportunities missed. In my opinion, I think this puts the kibosh on something as ham-handed as a long-running confirmatory indicator. Why? Because I think that it over-corrects for a flawed order logic system that doesn’t take into account the magnitude of the slope of the indicator. Obviously, trading in a countertrend (descending indicator) is a terrible idea. But what about a slight change of directional sign as part of a greater counter-trend? Suddenly, a robust, deliberately lagging confirmatory indicator no longer seems like such a bad idea. However, as you can see, the downside of a lagging indicator is that it may very well lag your primary indicator in a good portion of cases. And it does nothing to eliminate sideways trading. Surely, a more elegant solution exists that attempts to quantify the fact that sometimes, the smooth-yet-adaptive FRAMA can trend rapidly (and such trades should be taken posthaste), and can also go flat. 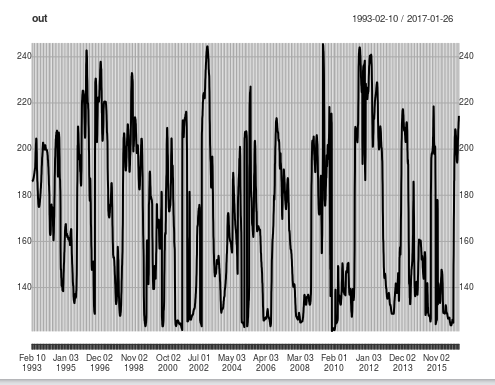 Ultimately, I think that while the indicator settings from ETFHQ have some merit, the simplistic order logic on its own can certainly hurt–and coupled with an order-sizing function that downsizes orders in times of trending while magnifying them in times of calm (a side-effect of ATR, which was created to equalize risk across instruments, but with the unintended consequence of very much not equalizing risk across market conditions) can cause problems. The next strategy will attempt to rectify these issues. This post examines an n-day median filter for two desirable properties: robustness to outliers and an inherent trend-confirming lag. While this is an incomplete filter (or maybe even inferior), it offers some key insights into improving the trading system. First and foremost, this will be a short-only strategy, due to the long bias within the sample period, so the stress-test of the system will be to attempt to capture the non-dominant trend (and only when appropriate). Here’s the strategy: we will continue to use the same 126 day FRAMA with the fast constant set at 4, and a slow constant at 300 (that is, it can oscillate anywhere between an EMA4 and EMA300). We will only enter into a short position when this indicator is descending, below the 126-day median of the price action, and when the price action is lower than this indicator (usually this means a cross, not in all cases though). We will exit when the price action rises back above the indicator. strategy.st <- portfolio.st <- account.st <- "FRAMA_III"
At this point, for the sake of brevity, I’ll leave off the equity curves and portfolio statistics (they’ll obviously be bad). However, let’s look at some images of what exactly is going on with individual trades. Here is the full-backtest equity curve and corresponding indicators for XLP. The FRAMA is in purple, with the 126-day median in orange, along with the 10-day ATR (lagged by a day) on the bottom. 1) ATR order-sizing is not a be-all, end-all type of order. It was created for one purpose, which is to equalize risk across instruments (the original idea of which, I defer to Andreas Clenow’s article). However, that is only a base from which to begin, using other scaled order-sizing procedures which can attempt to quantify the confidence in any particular trade. As it currently stands, for short strategies in equities, the best opportunities happen in the depths of rapid falling price action, during which ATR will rise. One may consider augmenting the ATR order sizing function in order to accomplish this task (or merely apply leverage at the proper time, through modifying the pctATR parameter). 2) While the running median certainly has value as a filter to keep out obviously brainless trades (E.G. in the middle of an uptrend), once the FRAMA crosses the median, anything can happen, as the only logic is that the current FRAMA is just slightly lower than the previous day’s. This may mean that the running median itself is still rising, or that the FRAMA is effectively flat, and what is being traded on is purely noise. And furthermore, with ATR order sizing amplifying the consequences of that noise, this edge case can have disastrous consequences on an equity curve. 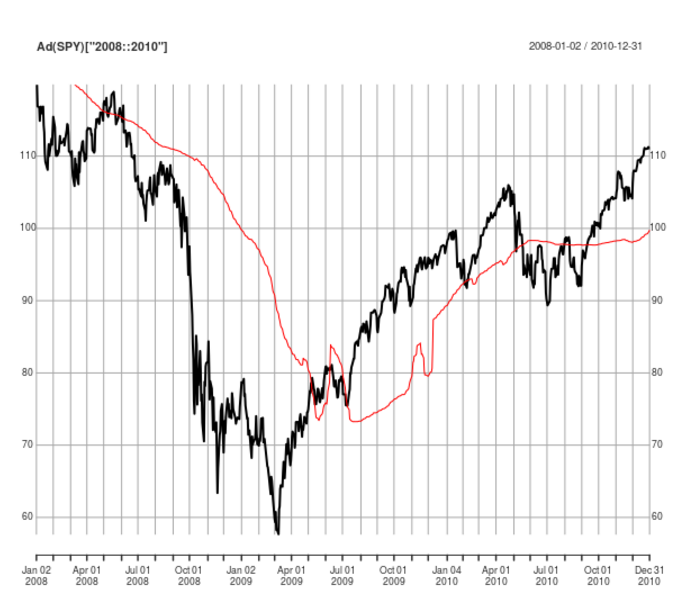 Here’s a zoom in on 2005, where we see a pretty severe drawdown (chart time series recolored for clarity). As can be seen, even though the FRAMA seems to be slightly rising, a price crossing when the FRAMA is lower than the previous day by even an invisibly small amount (compare the purple–the FRAMA, to the red–the same quantity lagged a day) is enough to trigger a trade that will buy a sizable number of shares, even when the volatility is too small to justify such a trade. Essentially, most of the losses in this trading system arise as a result of trading during these flat periods during which the system attempts to force action. This pattern repeats itself. Here is the equity curve for XLB. Again, aside from maybe a bad trade in the end thanks to any trade being taken once all three conditions line up (decreasing FRAMA, FRAMA lower than median, price lower than FRAMA) too late due to a flat FRAMA/median relationship, most of the losers seem to be trades made during very flat and calm market action, even when the running median may be going in the opposite direction of the FRAMA, during which the ATR order-sizing function tried to force action. A second filter that serves to catch these edge-case situations (or maybe a filter that replaces the running median entirely) will be investigated in the future. The running median filter is an intrinsically lagging but robust indicator, chosen deliberately for these two properties. It is able to filter out trades that obviously go against the trend. However, due to some edge cases, there were still a great deal of losses that were incurred, which drown out the one good shorting opportunity over this sample period. This is an issue that needs addressing. As with TVI, when the signals and rules were swapped for the short end, the equity curve was an unmitigated disaster. Unlike the flat-during-bull-runs-and-permanently-popping-up equity curve of ETFHQ, this equity curve was a disaster. For those that read the final TVI post, the equity curve looked almost identical to that–just a monotonous drawdown until the crisis, at which point the gains aren’t made up, and then the losses continue. In short, there’s no need to go into depth of those statistics. As the link to ETFHQ suggests, we will use a longer-term FRAMA (the n=252, FC=40, SC=252 version). The market will be in an uptrend when the fast FRAMA (the FRAMA from the previous post) is above this slower FRAMA, and vice versa. Furthermore, in order to avoid some whipsaws, the fast FRAMA will have to be ascending (or descending, during a downtrend), and the entry signal will be when the price crosses over (under) the faster FRAMA, with the exit being the reverse. In the interest of brevity, since the sample period was an uptrend, then a great deal of strategies will look good on the upside. The question is whether or not the strategy does well on the short side, as the litmus test in testing a confirming indicator is whether or not it can create a positive expectation in a strategy that is counter-trend to the dominant trend in the sample data. As this is a replication of an implied idea by ETFHQ (rather than my own particular idea), let’s look at the code for the strategy. In this instance, both the long and short end of this symmetric strategy are included, and in RStudio, commenting or uncommenting one half or the other is as simple as highlight+ctrl+shift+C. strategy.st <- portfolio.st <- account.st <- "FRAMA_II"
#by the HLC function as "low", which causes issues. Again, to reiterate, the system will take a long position when price crosses over (under) a rising (falling) fast FRAMA that’s higher (lower) than the slow FRAMA, and exit that position when the price crosses back under (over) the fast FRAMA. The cross must happen when the other two conditions are intact, as opposed to a trade being entered when all three conditions come together, which may be in the middle of a trend. As the majority of the sample data was in an uptrend (and the fact that the Andreas Clenow-inspired ATR order-sizing function pays enormous dividends in protecting for a limited time in a counter-trend), I decided to put the (slightly modified–with the one condition of rising in an uptrend or falling in a downtrend) system to the test by testing it on the non-dominant trend in the sample–that is, to see if the system can stay out at all points aside from the crisis. In other words, we can already see that the proposed confirmatory indicator is a dud. To display the raw instrument daily stats at this point would also be uninteresting, so we’ll move past that. In other words, even though the market exposure is rather small, the system still manages to hemorrhage a great deal during those small exposures, which does not sing many praises for the proposed system. 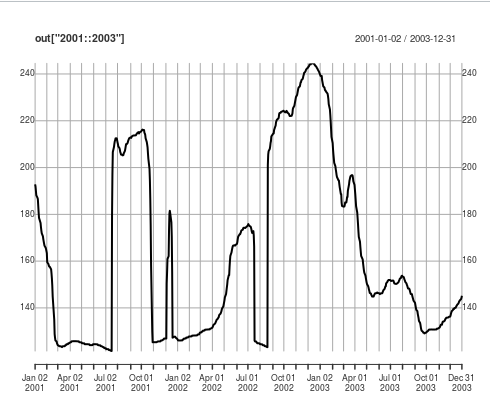 For that, we’ll look at a picture of the equity curve of an individual instrument, complete with overlaid indicators. The primary indicator is in purple, while the confirmatory indicator is in orange. And now we see the reason why: because although the FRAMA (n=252, FC=40, SC=252) is a seemingly fine parametrization in and of itself, as a “big-picture/long-term-trend/greater smoothing” indicator, it does not seem like the best choice, at least in the conventional sense as using something such as the SMA200, ROC200 > 0, or RS Rank (see this post from SystemTraderSuccess). Why? Because from my intuition, adaptive moving average indicators all aim to do the same thing–they aim to be a more accurate way of aggregating lots of data in order to tell you what is happening to as close as current time as they can get. That is, if you look at the presentation by Dr. John Ehlers (see this link), you’ll notice how similar all of the indicators are. All of them effectively aim to maximize near-term smoothness and eliminate as much lag as possible. That is, if you’re looking to make short-term momentum trades that last five days, if your indicator has a five-day lag (EG a 10-day running median), well, your indicator isn’t of much use in that case, because by the time you receive the signal, the opportunity is over! However, while eliminating lag is usually desirable, in one case, it isn’t. To go off on a tangent, the Japanese trading system called Ichimoku Kinko Hyo (which may be investigated in the future), created by Goichi Hosoda, deliberately makes use of lagging current price action to create a cloud. That is, if you want a confirmatory indicator, you want something robust (especially to the heightened volatility during corrections, bear markets, downtrends, etc. ), and something that *has* a bit of lag to it, to confirm the relationship between the more up-to-date indicator (E.G. an adaptive moving average, a short-term oscillator such as RSI2, etc. ), and the overarching, long-term trend. The failure to do so in this case results in problematic counter-trend trades before the financial crisis. While the trading during the financial crisis had a very choppy equity curve during the height of the crisis itself, this was for an individual instrument, and note, that by the end of the crisis, the strategy had indeed made money. The greater problem was that due to the similarities in kind of the confirmatory indicator with the one used for entries and exits, then occasionally, the confirmatory indicator would overtake the indicator it was supposed to confirm, even in a sideways or upwards market, which resulted in several disastrous trades. And while the indicator used for entries and exits should be as up-to-date as possible so as to get in and out in as timely a fashion as possible, a confirmatory indicator, first and foremost, should not reverse the entire system’s understanding of the market mode on a whim, and secondly, should try to be more backward looking, so as to better do its job of confirmation. Thus, in my opinion, the recommendation of this “slower” FRAMA to be used as a confirmatory indicator by ETFHQ was rather ill-advised. Thus, the investigation will continue into finding a more suitable confirmatory indicator.